Fox Business’ Stuart Varney attacked Sen. Elizabeth Warren’s (D-MA) proposal to provide debt relief to over 42 million student borrowers and to make public college free, characterizing it as nothing more than a vote buying scheme. But the student debt crisis is a major problem for the U.S. economy, with tens of millions of defaults expected in the next few years. Varney failed to acknowledge the severity of the student debt problem. As CNBC’s report on Warren’s proposal explained, “By 2023, nearly 40% of borrowers are expected to default on their student loans, an event that only increases their debt and devastates their credit.” And student debt disproportionately harms students of historically Black colleges and universities: According to The Wall Street Journal, students of these schools have 32% higher median debt load than students from other public universities. Fox's Brian Kilmeade: "There is not one person out there that wants to go to community college that can't afford it"
In a little-noticed action, on August 18, the Department of Education announced a rule change that will further loosen accountability of for-profit colleges. 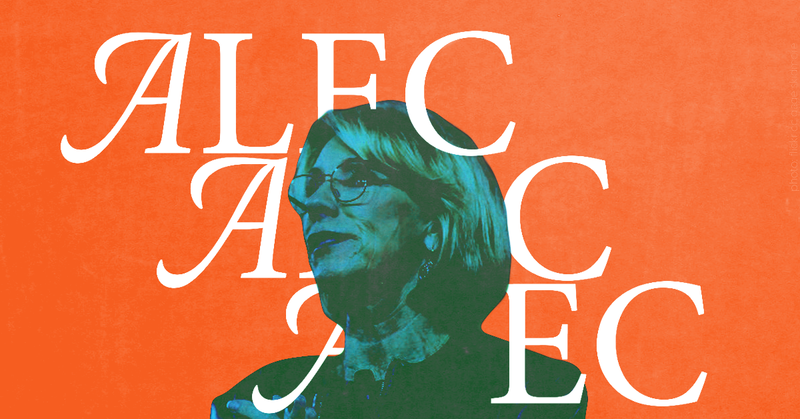 The move signals a continuation of Education Secretary Betsy DeVos’ American Legislative Exchange Council-inspired agenda: favoring the interests of fraudulent for-profit colleges over victimized students, and dismantling higher education accountability structures. In 2010, the administration of then-President Barack Obama announced new rules designed to ensure that for-profit career preparatory colleges yielded appropriate levels of “gainful employment” for their graduates. According to The Washington Post, the rule “effectively would shut down for-profit programs that repeatedly fail to show, through certain measures, that graduates are earning enough to pay down the loans taken out to attend those programs.” After a series of court challenges, and a process of negotiated rulemaking, the final guidelines were set to be instituted on July 1, 2017. Even before the rules were implemented, evidence indicated that the pending gainful employment regulations were already having an impact, with many colleges proactively shutting down programs that might have been noncompliant. Back in 2010, right-wing media were up in arms over Obama’s efforts to make changes to gainful employment rules. For instance, Breitbart.com claimed it was a sign that “for-profit education” was “under assault” and that Obama was “intentionally targeting job-creating schools.” The Daily Caller asserted that the Department of Education couldn’t be trusted to fairly renegotiate these rules. On July 20, DeVos spoke before the annual convention of the American Legislative Exchange Council (ALEC), a corporate bill mill that shares model right-wing legislation with sympathetic state legislators. In her speech, she outlined a vision of higher education that includes changes to the gainful employment rule. DeVos characterized the Obama administration rewrite of the rule as “textbook overreach,” claiming it was part of an “administration-wide war on every type of organization they didn’t like.” Several for-profit colleges and trade groups are past or current members of ALEC, including the Association of Private Sector Colleges and Universities (the trade association of for-profit schools), Bridgepoint Education, Corinthian Colleges, and Kaplan Higher Education. In addition to the gainful employment rule change, DeVos has made other rule changes that benefit for-profit colleges. She elected to delay implementation of the borrower’s defense provision, which would have provided debt relief to students who were defrauded by for-profit universities. As of July 26, she had failed to approve a single application from over 65,000 students who applied for relief from debt accrued while attending now-shuttered for-profit colleges. The New York Times questioned whether DeVos’ Department of Education could be impartial about for-profit colleges when she appointed Richard Eitel, who had worked for a company that runs the troubled for-profit college chain Ashford University, to a special adviser position. DeVos also hired Taylor Hansen, a for-profit college lobbyist, onto her transition team. Sen. Elizabeth Warren (D-MA) questioned DeVos over Hansen’s many conflicts of interest, and he resigned the same day. In addition, there are a substantial number of Education Department staffers with ties to dark-money “education reform” echo chamber groups that seek less accountability for for-profit institutions. Despite “ethical questions,” Secretary of Education Betsy DeVos continues to invest money in the scientifically dubious company Neurocore, according to Education Week. In an August 7 report, Education Week reported that DeVos has “significantly increased her family’s financial stake” in the “brain performance” company Neurocore, which “makes questionable claims” about its ability to treat a number of neurological conditions in children and adults. Neurocore purports to treat patients by analyzing their brainwaves and other biological signs, then providing “neurofeedback sessions” through which they can train their brains to function better. The company often uses such treatments with both adults and children. It charges as much as $2,200 for a 30-session cycle. Overall, the evidence base for neurofeedback is weak, experts say. Still, Neurocore has claimed that its technology can “fix” problems such as attention-deficit hyperactivity disorder and has “proven and long-lasting” positive effects on children with autism. In January, Education Week reported that the American Academy of Pediatrics and leading researchers all said there was limited evidence to support such assertions. Three experts consulted by Education Week all questioned the legitimacy of such claims, citing serious flaws with the study’s design that prevented it from generating credible evidence. “They’re misleading, at best,” said Rebecca A. Maynard, a professor of education and social policy at the University of Pennsylvania’s Graduate School of Education. “It bothers me to see anyone misusing evidence and promoting things that mislead the public,” said Maynard, a former commissioner at the Institute of Education Sciences, the research arm of the federal education department that DeVos now heads. Raising her financial stake in Neurocore does not cross any clear ethical lines, and federal ethics officials signed off on the moves, said Larry Noble, the senior director and general counsel at the Campaign Legal Center, a Washington nonprofit staffed by election-law experts who promote public participation in democratic processes. But the transactions do raise some new ethical questions for DeVos and the public moving forward, Noble said. The Trump administration has failed to provide relief to tens of thousands of students who were left with a “near-worthless degree” and large amounts of debt after attending fraudulent for-profit colleges that have since closed. Betsy DeVos’ Department of Education has delayed implementation of new rules that would better protect student borrowers, and several recent newspaper stories have captured the human cost of the lingering debt. 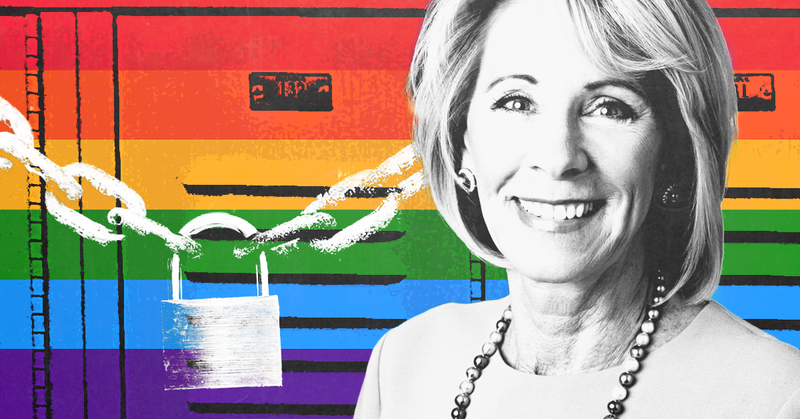 During a House hearing last week, Secretary of Education Betsy Devos refused to say whether private schools that discriminate against LGBTQ students and their families would be eligible for federal funding under a proposed voucher initiative. Print coverage of the hearing and her remarks largely failed to expose the pervasive problem of anti-LGBTQ discrimination in state-funded voucher programs. On May 24, Betsy DeVos testified before the House Committee on Appropriations on the Trump administration’s proposed 2018 education budget. DeVos was questioned at length about the budget’s proposed federal voucher program, which re-directs public money to pay all or part of the private school tuition for participating students. Lighthouse Christian Academy, an Indiana private school that receives public voucher money while openly discriminating against LGBTQ students and families, was at the center of the debate. DeVos repeatedly refused to rule out allowing schools that discriminate against LGBTQ students and families to access federal funding. A Media Matters search of U.S. newspapers available in Nexis returned 50 news stories, op-eds, and editorials between May 24 and 31 on the DeVos hearing (20 original stories, 30 reprints). Of these, only one original story, in The Washington Post, briefly mentioned that voucher schools other than Lighthouse Christian Academy discriminate against LGBTQ students and families: "Researchers have found that many states allow religious schools that receive taxpayer-funded vouchers to deny admission to lesbian, gay, bisexual and transgender students or children with LGBT parents." No other story stated that other schools discriminate against LGBTQ students and families, mentioned any other state where discrimination has been found, or discussed existing research on discrimination in voucher programs. As the Post alluded to, research has demonstrated a pervasive pattern of anti-LGBTQ discrimination in voucher schools across several states. In North Carolina, The Century Foundation characterized North Carolina’s voucher program as “highly discriminatory” and found multiple examples of explicit anti-LGBTQ discrimination. Multiple other researchers found widespread anti-LGBTQ discrimination in the North Carolina voucher program. In Indiana, NPR reported that the Indiana Department of Education says schools are prohibited from denying entry based only on “race, color, national origin or disability” -- not sexual orientation -- and that there is “evidence that these protections are limited and open to interpretation." The open discrimination of Indiana's Lighthouse Christian Academy was also raised in the committee hearing. It is likely that many more voucher schools covertly discriminate against LGBTQ students and their families because state voucher programs permit schools to discriminate. A 2016 study in the Peabody Journal of Education titled “Dollars to Discriminate” examined the language of all existing state voucher statutes and found that “none of the 25 voucher programs studied prohibit discrimination against students on the basis of sexual orientation.”This means that no existing voucher programs protect LGBTQ students from discrimination. Failure to prohibit discrimination in state voucher programs has led to widespread discrimination against LGBTQ students and families by hundreds of schools receiving millions of public dollars. Media coverage should reflect the fact that anti-LGBTQ discrimination is already a serious problem in existing voucher programs, and that any federal voucher program that fails to address this discrimination would be likely to amplify the problem. A Nexis search was conducted for U.S. newspapers and wires using the search terms “DeVos” and “voucher” or “private school” or “lgbtq” or “lgbt” or “gender” or “sexuality” or “sexual orientation” for one week starting on the hearing date (5/24/17-5/31/17). Among five major national newspapers -- The New York Times, USA Today, Los Angeles Times, The Wall Street Journal, and The Washington Post -- only the Post and the Journal covered the deal. 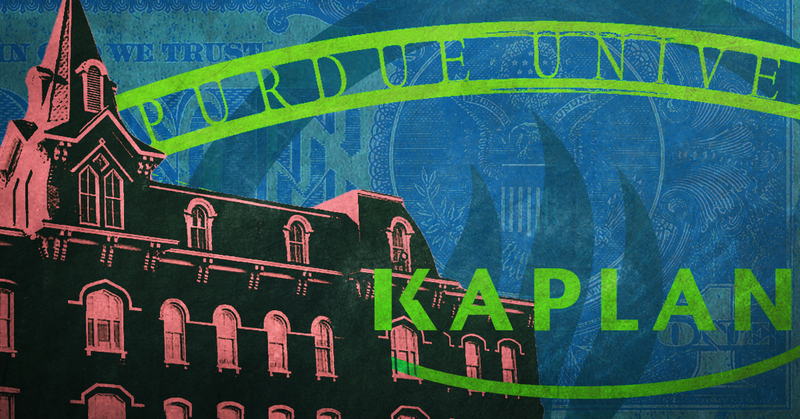 The Post published one article that discussed the state and federal investigations of Kaplan. The Journal published three news stories and one op-ed about the deal. Between these four pieces, the Journal made no mention of the federal and state investigations into Kaplan, but two pieces discussed faculty complaints about being excluded from the decision-making process (one of them just passingly) . 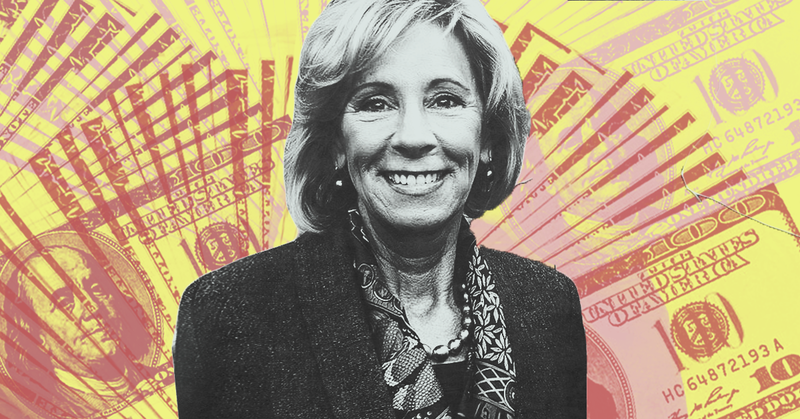 Journalists have spent months investigating the complicated connections of education secretary nominee Betsy DeVos, attempting to untangle her financial dealings and ideological stances on public education. In light of DeVos’ January 17 Senate committee confirmation hearing, Media Matters highlights some of the findings from quality investigative reporting on the billionaire Republican mega-donor. Private corporations, lobbyists, and a national group connected to major dark-money, anti-teachers-union donors are major contributors to a campaign supporting a state education proposal that is fiercely opposed by teachers and parents, The Atlanta Journal-Constitution reported. Amendment 1, which will be on state ballots in November, has attracted millions in funding from groups in support and in opposition of the proposal, including substantial funding from national teachers unions for an advertising campaign opposing the measure. Teachers groups and the state PTA have spoken out against Amendment 1, explaining that its passage could eliminate local control by school boards and community members -- particularly in black and Latino communities -- and could shift tax dollars to private charter management companies or other groups that are subject to less oversight. As the Journal-Constitution reported, the National Education Association has spent heavily on a campaign opposing the amendment representing 35,000 Georgia teachers who are among its ranks. But the identities of donors bankrolling the advertisements in support of the proposed amendment -- as part of an organization called Opportunity For All Georgia Students -- were purposely concealed using a group set up by supporters of Gov. Nathan Deal. The group, Georgia Leads, is categorized as a “social welfare” group with a 501(c)(4) tax status, and as such is not required to disclose its donors. Of the four donors contributing a total of $1.22 million to the campaign in support of Amendment 1, Georgia Leads contributed the most substantial amount -- $810,000. The biggest donor to the pro-OSD amendment this year — as of Sept. 30 — was Georgia Leads Inc., a fund set up to push Deal’s agenda. Georgia Leads had put $850,000 into Opportunity for All Georgia Students as of the end of September. While Georgia Leads doesn’t disclose donors, The Atlanta Journal-Constitution found more than $250,000 in contributions to the group by reviewing expenditure listings by companies and political action committees who file reports with the state ethics commission. All the donors have big stakes in legislation at the state Capitol, including AT&T, the retail store lobby, McGuireWoods (one of the best-connected lobbying firms at the Statehouse), Hospital Corporation of America, beer distributors and bank lobbyists. The investigation also identified the national group 50CAN as another major donor to the pro-Amendment 1 campaign, second only to Georgia Leads. 50CAN is affiliated with a dark-money-fueled echo chamber pushing conservative, anti-union policies under the guise of “education reform,” and has supported past Georgia initiatives to open up schools to private competition, as well as similar Opportunity School District-type initiatives in other states. It is affiliated with a number of other national groups that received dark-money funding from anti-teachers-union private donors. Graphic created by Sarah Wasko. A recent Media Matters analysis found an overall lack of substantial discussions about college affordability issues on evening cable news programs. Notably, nearly a quarter of the total time spent discussing topics related to college affordability across all three major cable networks over the course of a year came from MSNBC’s Hardball with Chris Matthews. Hardball’s discussions about topics such as rising college costs and student debt burdens illustrate what may have been the driving force for a vast majority of the limited conversations the study found across all networks -- a tie-in with the current presidential election. In a recent study, Media Matters analyzed a year of evening cable news programming on Fox News, CNN, and MSNBC and found that, together, all three networks devoted just under 2 hours and 22 minutes in 56 segments, in total, to discussing college affordability issues over the course of the year. Fox News’ and MSNBC’s evening news programs each spent a little under an hour discussing these topics (24 and 23 segments, respectively), and CNN devoted just under 35 minutes, or nine segments. MSNBC’s Hardball single-handedly accounted for just over a quarter of the total number of qualifying segments in this study and nearly half an hour of total discussion time. Why did Hardball account for such a large proportion of the total substantial discussion in Media Matters’ analysis? One finding suggests it was an election-year phenomenon: All 15 of the Hardball segments included in the study feature at least one guest discussing a specific presidential candidate’s record, stances, or policy proposals related to college affordability. Although host Chris Matthews’ questions or assertions about candidates’ stances often only grazed the surface, they show that cable news programs are capable of providing more in-depth coverage on college affordability when the interests of the host, guests, and the public converge. In many of these segments, Matthews introduced the topic by asking guests -- often strategists or campaign surrogates -- to explain higher education policy differences between the two then-Democratic presidential hopefuls: former Secretary of State Hillary Clinton and Sen. Bernie Sanders (I-VT). Discussions of these differences frequently focused on political strategy and voter appeal as much as on the details of the proposals. Though many of these exchanges were brief or limited in scope, Matthews’ questions about Sanders’ and/or Clinton’s policy proposals demonstrate that evening cable news has the capacity to provide detailed, policy-focused discussions under the right circumstances: when guests are eager to talk about the issue, hosts are prepared to ask questions, and viewers have demonstrated a desire for more information. The presidential race appears to have dictated these particular circumstances for the year studied. In fact, the majority of qualifying guests on each of the three cable networks specifically talked about at least one presidential candidate’s record or views on a college affordability issue -- or they were themselves a candidate at the time of their appearance. When considering only those guests who spoke substantially about college affordability topics (many guests were participants in multitopic discussions, but did not speak specifically about college affordability), that number jumps even higher. Nearly 90 percent of guests who discussed college costs, student loans, or impacts of the national student debt burden also mentioned a specific presidential candidate’s record or stances on these issues. With so many of the college affordability discussions on evening cable news closely tied to the presidential election, it’s unclear what will happen to those (already limited) conversations after November. Image created by Sarah Wasko. Video created by Coleman Lowndes.